James Dashner is the author of The Maze Runner, The 13th Reality, and the Jimmy Fincher Saga. His novel The Journal Of Curious Letters was chosen for a 2008 Borders Original Voices pick, and Kirkus Reviews selected The Maze Runner as one of the best young adult books of 2009. Matthew Peterson: My next author is James Dashner, author of the 13th Reality series and the Maze Runner. Now, the Maze Runner is the Junior Library Guild Selection and it also is a Barnes and Noble Discover Great New Writers Selection. Thanks for being on the show today, James. James Dashner: Hey, thank you. It’s great to be here. Matthew Peterson: So you’re kind of having a whirlwind experience right now, aren’t you? James Dashner: Yes. It’s been amazing. The book came out and my publisher, Random House, is sending me all over the country which is kind of a whirlwind, but a lot of fun. Matthew Peterson: Now, you came from a smaller publisher with several books: The Jimmy Fincher Saga. You started to get a little bit more notice from The 13th Reality series, but both of those were still from smaller publishers, weren’t they? James Dashner: Yeah. My career has kind of taken little baby steps. Yes, the first book you mentioned, The Jimmy Fincher Saga, that publisher was really, really, very small and it kind of just got me a little bit of exposure on a very small regional basis, and that led to 13th Reality, which was a little bit bigger, and that led me getting a great agent, and that led me to the Random House deal. So kind of been stepping stones. Matthew Peterson: Yeah. So tell me, what is the big difference that you’ve seen so far from going from a smaller publisher to all of a sudden hitting the big time, getting a very large publisher? James Dashner: Oh, yeah. It’s . . . you know as much as I have enjoyed the experience from the other publishers, I mean, this is just a night and day difference. The marketing power, the distribution power, just the legitimacy with bookstores and stuff. It’s just a totally different world, and it’s fun. I love it! Matthew Peterson: I have a lot of experience with small publishing ‘cause I worked with a small publisher with my first book [Paraworld Zero] and what you said right there is the key. Distribution is probably the big thing that the big publishers really have, and distribution is kind of a . . . it’s either a make it or break it thing. If you have distribution then you have a way better chance of having success. Now of course, the small publishers have a niche. You know, they can get into places that the big publishers don’t try to get into, and that’s kind of how they can do their thing. So I’m not downplaying small publishers in that sense, ‘cause they definitely have their roll. 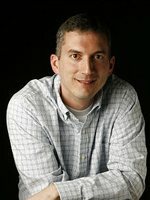 James Dashner: You know, we love the independent stores, and that’s a big part of it, but also to have the advantage of being in things like Walmart and Costco and Target, stuff like that, just provides you an opportunity where so many people who might not see it or know about it can be exposed to your book. So the distribution, like you say, is amazing. James Dashner: They kind of use it as a way to weed out the thousands of books they have to look through, I guess. Matthew Peterson: Yeah. Well, let’s talk about The Maze Runner. It’s such an interesting concept. Tell us a little bit about The Maze Runner. James Dashner: Okay. It’s a book kind of set in the future in a dystopian, sort of post-apocalyptic world, kind of dark and scary. The story begins with a boy named Thomas. He’s sixteen years old, and it starts with him in this dark box and it’s moving upward like an elevator, and his memory’s been wiped and he’s obviously terrified wondering what’s going on. And eventually some doors open up and he’s pulled into this place called the Glade by a bunch of other teenage boys. And it’s basically this little community that’s literally surrounded by a giant stone maze. And there’s these hideous creatures called Grievers that live out there. And Thomas has to suddenly adapt to this community, and as he does arrive, things begin changing and these boys realize that they have to escape because lots of bag things are happening. And then a girl shows up, then even more things start changing, so it’s kind of a mystery, adventure, scary story. Matthew Peterson: And they send out people to kind of find their way out of this maze, everyday? James Dashner: Yeah, each of the people in the Glade have their own little responsibilities. So there’s people who take care of the animals, and they have crops, ‘cause they’re basically a self-sustaining little community. But the most elite job is to be a runner. Those are the guys who go out into the maze and try to find a way out, which they can’t do. But when Thomas arrives and things begin changing, the stakes really get higher and they kind of get frantic and they have to get out. So, yeah, from the very beginning he wants to be a runner. Matthew Peterson: Is there a possibility of a sequel to this? James Dashner: Yes, actually, almost from the very beginning this has been mapped out as a trilogy, and Random House has committed to the whole trilogy. So yeah, two is actually written and it will come out next October. Matthew Peterson: Oh good. Exciting! Matthew Peterson: I wanted to also talk about your 13th Reality series. You know, we talked a little bit about small publishers and I totally forgot that your publisher for that series was Shadow Mountain Press. When it comes to small publishers, they’re big. [laughs] They actually have some money to back them up. They have some distribution, a niche distribution like I was talking about. They’re the ones who started the Leven Thumps series and Fablehaven series, which have gone on to be best selling books and stuff. So the small publisher you did have was kind of a nice one to have. And they’ve done some good things with the 13th Reality. Tell us a little bit about the 13th Reality. James Dashner: Yeah, you’re right, the Jimmy Fincher Saga was a teeny-tiny publisher, Shadow Mountain was kind of in between, and then of course Random House is big. Shadow Mountain’s great. I think a big key to their success is with Fablehaven, Leven Thumps and now my series, they’ve sold the paperback rights to Simon and Schuster. James Dashner: So it’s kind of a partnership. Shadow Mountain has a lot going for them: they’re very creative, they’re great at cover design, they’re really good at promoting and getting in the schools and stuff like that. You combine their skills with Simon and Schuster’s distribution and marketing power, and it’s worked really well for those two series. You know, I think people will start hearing about the 13th Reality, especially when my first paperback from Simon and Schuster comes out this Christmas. It kind of deals with alternate realities and all these different versions of our world that are at different points in their advancement and technology and stuff. And the main character, his name’s Atticus. He kind of gets swept into this group that studies these alternate realities, and they’re realizing that physics and science are starting to be mutated and twisted into magic. And that’s kind of the basic premise. James Dashner: Yeah, a lot of people have used that concept. But it’s so fun because there’s a billion ways you can put your own twist on it and the possibilities are endless in terms of storylines, plot lines, interesting characters, interesting conflicts. I’m having a lot of fun with that series. Matthew Peterson: And do you expect more books in that series? James Dashner: Yes, yes, the third book will come out in April of 2010, and then it’s planned to be five books total. Matthew Peterson: Five books total, okay. All from Shadow Mountain and Simon and Schuster for the paperback? James Dashner: Correct, yep. I never really planned to have two series at once, but it just kind of all came together and worked out that way. Matthew Peterson: Yeah. Sometimes it’s hard to see this far into the future, as you know. Like I said, it’s kind of a whirlwind experience right now. You’ve got two series going on, but is there anything else in the pipeline that you can foresee? James Dashner: Well, you know, the next two years will be pretty occupied with The Maze Runner trilogy and the 13th Reality, because this is just how a writer is. I have already kind of started putting together the basic first ideas for my next project which I’m really excited about, but I have to force myself not to work on that yet. Matthew Peterson: Yep. [laughs] Well, that’s great. Well, I’ve been speaking with James Dashner, author of the 13th Reality and also The Maze Runner. Well, thanks for being on the show today, James. James Dashner: Hey, thank you. It was fun talking to you. Matthew Peterson: Well, that’s it for today. Be sure to visit www. TheAuthorHour.com to listen to the bonus questions that didn’t air on the show. Next week I’ve got some of the most popular children’s authors around: Kate DiCamillo, Tony Abbott, Bruce Coville, Diane Duane and her husband Peter Morwood. See you next time.